Do your thing, bring your bling; add bingo riches to your lingo, then shout out I have Bingo! 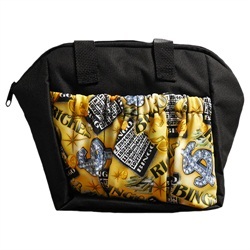 Live it up with this 6-pocket dauber bag that displays your riches. Six pockets line the outside and are perfect to hold daubers. It also has plenty of space in side. Daubers purchased seperately.